When I was new knitter, I often wondered about how the design process worked. Did you just have an idea and then start knitting it? Did you draw the whole thing out on graph paper first and then knit it? Did you work it all out mathematically and then write the pattern perfectly first time? In truth it is a little bit of all of them (although you never write a pattern perfectly just from the maths! ), it varies depending on the idea and the challenges it presents you with. 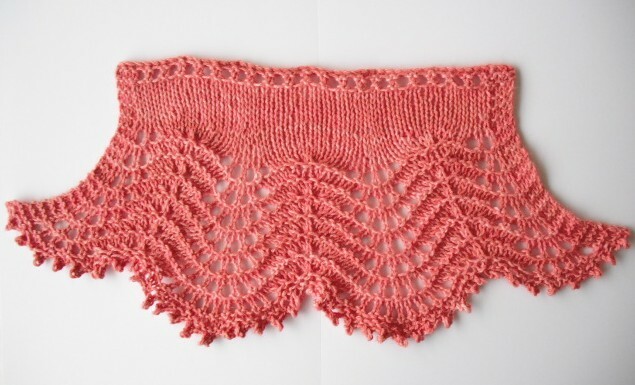 Sometimes an idea that is great in your head looks dreadful when you try to knit a swatch, or is just too unwieldy for anyone to actually enjoy knitting it (and we all knit for fun, so you don’t want it to be purgatory), and sometimes an idea just evolves as you go, with subtle changes that end up being the things you like most about the design appearing as you knit that swatch. 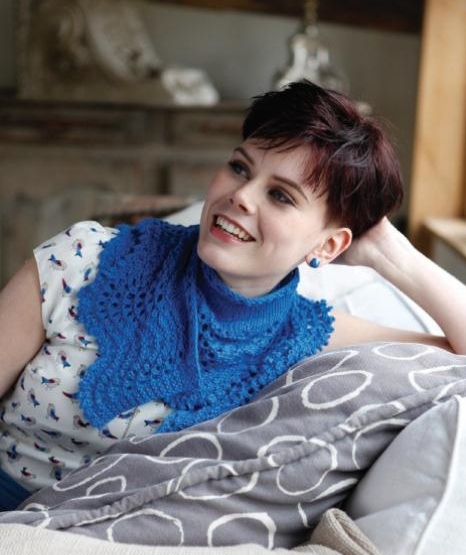 So, as my Mae shawl and shawlette that I designed for Artesano for their Vintage Handknits booklet is republished in Knit Now this month (Issue 11) I though I would take you behind the scenes and show you the design process behind it. As you might have guessed, the design brief for this booklet was ‘vintage’. 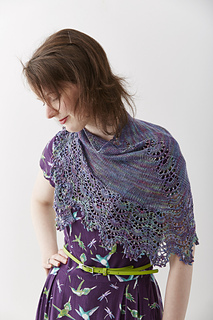 I wanted to do a crescent shawl, but from the top down, to allow for adaptation in terms of size. This idea had been developing in my head for a little while and seemed just the right sort of thing for a lovely drapey yarn (especially when worked on larger needles – Mae is knitted on a 5mm) like Artesano DK or Artesano 4ply (both yarns are featured in the booklet), so I went ahead and knitted a swatch. As is often the case there wasn’t much time and in this instance I wasn’t sure which yarn I would be given if my design was selected, and I didn’t have any Artesano DK or 4ply in my stash, so as the observant amongst you might have noticed I used Manos del Uruguay Serena, as the most important thing at this stage was establishing whether or not the idea would work. And it did! 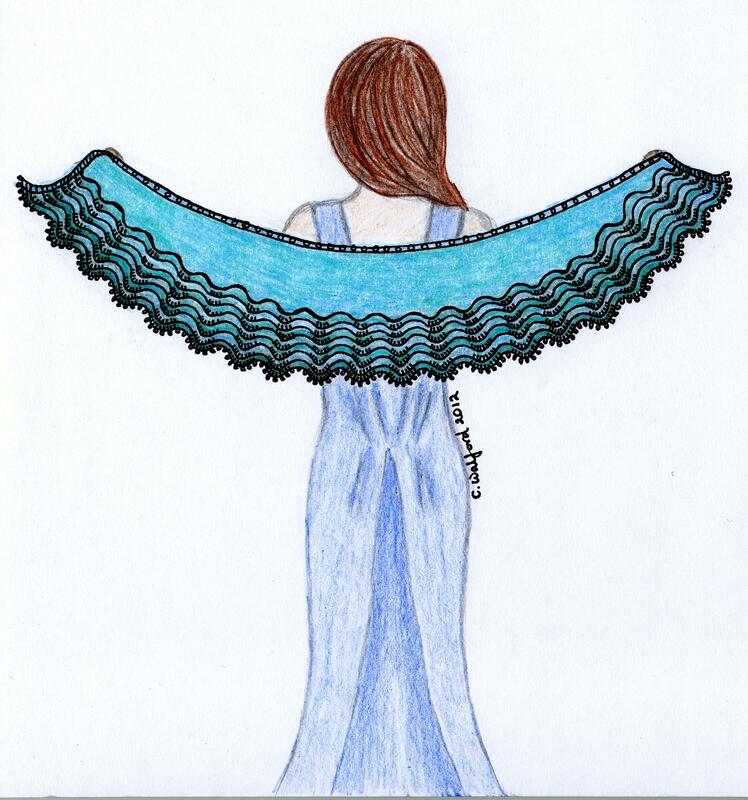 So now I had mini version of the shawl and a definite idea of how I could construct it (a short row crescent from the top down so you could adjust the size, with expanding feather and fan pattern at the edge, finishing with a picot cast off) I could sketch! I usually find it better to sketch after swatching, because then I have a better idea of the scale of stitch patterns and can make my sketch a more accurate representation of the final design – there is no point doing a beautiful sketch only to find out on swatching that the idea doesn’t work! So then it was on to working out the fine details while waiting for the yarn to arrive (Artesano DK in #1492 Belize (pink) and #1291 Argentina (blue)), charting out the short rows to check my calculations, and carefully placing increases to shape the shawl – I used a lot of graph paper! Last but not least, actually knitting it (a good opportunity to check the instructions thoroughly)! As Artesano wanted two samples, I thought it would be nice to do two variations in the pattern to suit different tastes and occasions – one big dramatic shawl (in pink) that you could really wrap yourself up in for a glamorous evening cover up, and one smaller shawlette (in blue) to wear as a scarf or around your shoulders over a summery dress. I always like variations in a pattern so that you can really make it your own! So the pattern and samples were sent off and I waited for the photos and the finished pattern booklet with bated breath. When I saw them I was delighted. I think this is my favourite photography and styling for any of my designs so far! I love the different styling of the two variations – more casual for the shawlette and a definite glamorous look for the shawl. Now I just need to get around to making my own – I’ve got the yarn (Artesano DK #7609 Paraguay), but I’ve not got much further than that!